Food blogs are a wealth of information, but they only help if you can remember what that information is. I had read about SimBaLa in Rowland Heights from a number of sites similar to the one you're reading now. So when I was in the area, I remembered enough to seek it out. But what to order? Not so much. If I did, I would've known to try the sausages. That's what they're known for, you see. Not only that, there's also what's done to them: SimBaLa's sausages are served with wild-and-crazy toppings like kiwi, peach, chocolate, or strawberry jam. Suffice it to say, because of my poor memory, you won't be hearing about how well chocolate goes with Taiwanese sausage. 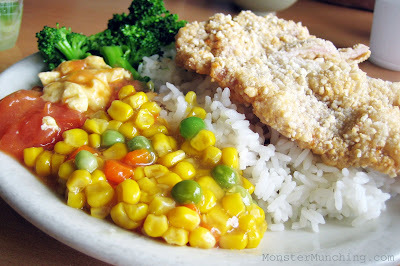 Instead I tried the pork chop rice ($5.75), which was the classic example of what a proper Taiwanese-style fried pork chop ought to be: bubbled with a crunchy batter, sweet as candy, and a perfect partner to rice. What I didn't like were the sides, which seemed to have been slimed with warm ectoplasm -- a cornstarch-y goo that covered the corn niblets and stretched out from every spoonful like snot. And there was this scrambled egg and tomato thing that had no business being anywhere in the proximity of my pork chops. A third side item of steamed broccoli would've been fine if it wasn't overcooked to mush. All could've taken a lesson from the cold celery dish ($3.00) I ordered. Snappy, brisk and refreshing, it was simply prepped to allow the main ingredient to shine. And since it was thoroughly freed of its pesky fibers, every spear was as effortless to eat as the next. The only thing I'd change is the presentation. The dish was unceremoniously served in its plastic takeout container. Would it kill them to put it on a plate? Spicy beef noodle soup ($6.50) -- a.k.a. niu rou mian -- was punchy, slightly licorice-y, and left my mouth numb from its slow chili burn. In the long-simmered darkness of the brew, hunks of beef braised slowly and tendon turned into softly chewy collagen knobs. Wonderful. 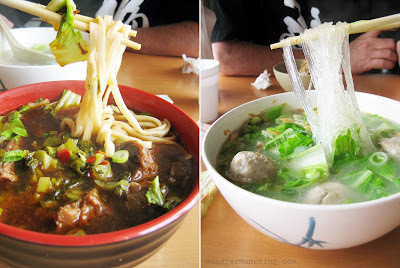 The meat ball vermicelli noodle soup ($5.75) was the niu rou mian's anti-matter. While the former was as brown as a brick, this broth could pass as milk. Its flavor was also the polar opposite. This one was mild and cleansing -- the perfect medium for the glass noodles, elastic strands that had the bounce of bungees. Next time, I'll remember to try those sausages and ask them to hold the slimy side items. Hopefully I'll have better luck remembering what I write in my own posts. My friends and I always visit this place when we crave for Taiwanese gourmet in the area. This is probably the only restaurant that stays true to authentic Taiwanese flavors. The cooks come around and about their first location in Arcadia. The grandpa/grandmas run it like a family business. Sausage with jam and chocolate syrup is a must. That's what the street sausages are covered with down south in Taiwan. Try their oyster pancakes and pumpkin stir-fried vermicelli. For drinks, try the frog's eggs. And since summer is here, the restaurant is know for their shaved ice with brown sugar. No MSG in their food is always a plus. I make the scrambled egg and tomato dish quite a lot. It is tasty, healthy and insanely easy to make. But I wouldn't serve it with pork chops. That is odd. Niu rou mian is one of Dave's favorites, and I like it a lot, too. Be sure to write about the next time you go and tell us about the sausages. I saw their oyster pancakes and was tempted to order...except we were stuffed! Next time, sausages & yes: Frog's eggs! I think I've had them once before somewhere else, but it's time to do them again. I've forgotten what they taste like. But inconsistency in the name is very strange. It's SinBaLa in Arcadia, but SimBaLa in Rowland Heights! Do you know why they're different? Believe it or not this was the first time I've had niu rou mian (at least with the noodles). I actually didn't realize it, but I've been enjoying the broth in Din Tai Fung's spicy beef soup, which is the same as the niu rou mian broth. I will definitely share my thoughts on the sausages! I had no idea they sold their unsold sausage! Heck, I guess I had no idea they specialized in it. Should've been more observant. Most everyone was eating sausages. Well, I guess you probably wouldn't have easily noticed the raw sausage anyway. They probably lose a lot of money with it, as the amount they give is way more than if you ordered it in the restaurant! Usually, for my location, it is either in the freezer or on the counter where they collect the money. It's vacuum sealed :). hmm i've never seen this place before. i'm going to have to map it to see where it's at. sounds pretty interesting. 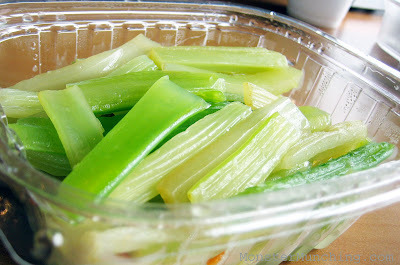 too bad about the overcooked stuff...lol that's pretty funny that they gave u the celery in a togo container. what's so special about their sausages? stopped by SinBaLa on the way back from Vegas (though I think it might have been the Arcadia location). the sausages are good, but of course, now that I'm spending so much in Taipei, it can't compare. now that I have an iPhone.. i just google everything if I really want to get the dish about a place before I order. but whether or not the place makes everything well is the true test rather than just a few key dishes, right? AH I see. Well, if I saw it, I probably wouldn't have bought it. The reason? I'm still trying to work through the Chinese sausages I bought at Costco two months ago. They're not bad...but man, now I have waaaaay too much. I still need to try SimBaLa's unique preparations. It seems that you can buy a single sausage topped with something for $1.25. Now that sounds like a snack. I was waiting for you to comment. If anyone can deem the place authentic and up to par, it would be you! Go to their arcadia location. I often heard friends complained about their RH location. Their dishes are not that authentic Taiwanese, except for the sausage, but close enough. Their shaved ice with "8?" choices is super. Thanks mimi! I also just heard from a friend of mine that the Arcadia one is the one to try. So I think it's pretty much unanimous. Elmo, you're probably the only blogger I know who's bothered to go to the same places I eat at with my hometown friends when we're visiting Diamond Bar. I was never terribly impressed by SimBaLa's sausages, but their spicy beef noodle soup and pork chop fried rice are winners, to be sure! The best sausage. wow....drooling.... I love these sausages. This is the original sausage. I have been going to Simbala quite often. I'm surprised that I never reviewed this place. They never failed me with their dishes. Anything I order comes out good. We sorta over ordered. The three of us ordered sausage rice, pork chop rice, beef noodle soup, fried chicken rice, chicken nuggets, radish cake, and the seaweed. All came out good. I think most everyone was eating sausages.